Burger King have been running a Whopper promotion on Facebook. 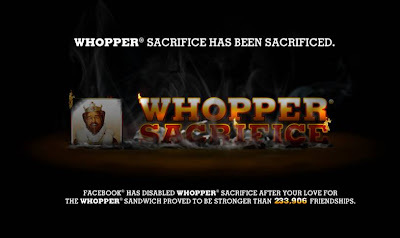 A Facebook application called 'Whopper Sacrifice' encouraged Facebook users to defriend 10 people and get a free Whopper in return. Although this is an unfortunate end, the volume of defriending that this campaign encouraged is a great validation of how engaging Facebook can be for advertisers!